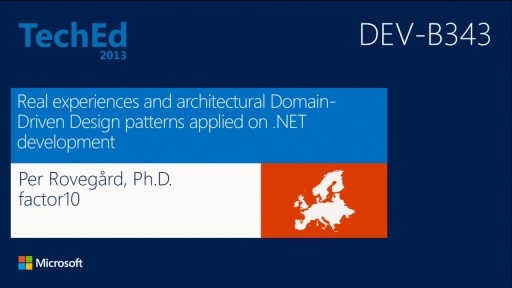 In this session, we share experiences from applying Domain-Driven Design in .NET enterprise applications and also give examples of how to realize DDD patterns across the system including storage and UI. Our basic premise is "the domain model is THE model." We also describe how test-driven approaches (TDD and BDD) relate to DDD, and talk about balancing domain focus with other activities such as UI design. A brief introduction to the main ideas and the most important tactical implementation patterns of DDD is given, so prior DDD knowledge is not required!